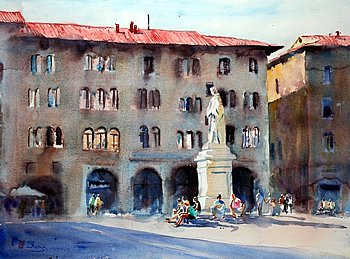 I have always enjoyed this square in Lucca and have lunch at a restaurant here and enjoyed people watching many times. What appealed to me immediately in this subject was the sense of light. The light catching the statue and the students sitting beneath it is an important part of conveying the mood. To help create a sense of light in any painting, it is the shadows and darks that are important. A cerulean Blue glaze was used on the background building to put it in shadow and create the contrast needed against the students. Cerulean Blue gives a wonderful granulation which enhances the texture of the building. This was painted as a class demonstration for my students at the Watermill. 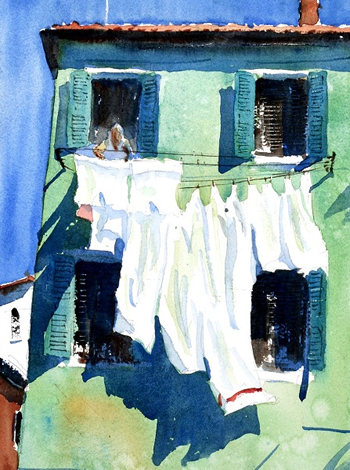 Yes they may have come to Tuscany to paint the beautiful Tuscan villages and landscape, but this painting showed that a painting can be made of the simplest and most mundane of subjects. This painting is a great lesson in wet into wet painting, tonal composition and subtlety. Of course, we painted the Tuscan landscapes and townscapes as well! A typical scene that can be seen throughout Italy. Basically what I tried to capture here was the breeze flowing through the washing on the sunny day. Notice that the shadows and sky are quite dark, but clean. This gives a strong contrast against the white of the washing and creates a feeling of strong sunlight. Weak shadows equal weak light, so make sure you have some nice dark and crisp shadows. Charles Sluga isn’t a typical artist. His early fascination with drawing and art instruction in acrylics from the age of 13 later gave way to an academic background in mathematics and physics. But Charles made the decision to follow his passion and became a professional contemporary artist more than 30 years ago. 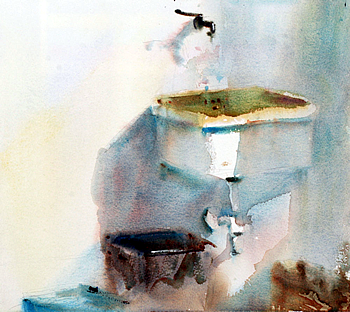 He is now recognised internationally as a master of “watercolours outside the square”. He shuns mediocrity, questions the purpose of painting, and challenges himself to push the boundaries of possibility. Charles captures diverse subjects in a broad range of styles ranging from the semi-abstract to loosely realistic. He isn’t afraid to mix media to achieve his vision, and much of his work is underpinned by careful research. His Monopoly Exhibition, the result of two years of detailed research and artistic documentation of the streets of London, is an excellent example of how he delves deeply into his subjects and applies structured thinking to his art. Charles’s technique has been described by critics as “impeccable” and his vision as “brilliant” and “evocative”. By taking risks he has helped elevate the status of watercolour as a major contemporary medium. His dedication to his artistic vision and pursuit of excellence has been rewarded with the coveted Alice Bale Award, inclusion in the International Watercolour Biennale, and an invitation to be represented at the New York Art Expo. He is one of the featured artists on the Winsor and Newton website and one of very few represented in their catalogue. 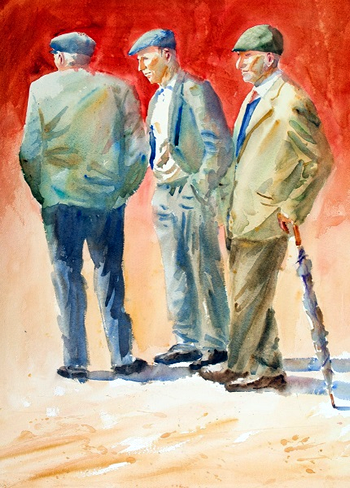 Charles’ work features in American publications such as Splash 11 and Watercolour Artist, and he was co-author of Contemporary Watercolours published in 2012. APV films has produced a DVD featuring Charles painting in various locations around London. His home is Yackandandah, in Victoria, Australia, but he travels the world to exhibit, run workshops, and conduct art tours. Every year he takes a small group to experience the magnificent Croatian coast. Charles is a man who loves the smell of the sea, the chill of winter, and the sound of laughter. He cries when he reads Steinbeck and wears his heart on his sleeve. He is happy to live in the world he creates in his mind. A highly popular tutor, Charles' workshops are relaxed, informal, inspiring and full of fun. We're delighted to welcome him to the mill again. You can find out more about Charles on www.slugagallery.com. "This was the most relaxing holiday I have had for a long time. The accommodation was lovely; the food, both at the watermill and local restaurants, was exceptional. The timetable was well organised and ran like clockwork, yet everyone remained relaxed and friendly." "In addition to being a very talented artist, Charles is an extremely capable and professional teacher, and from my discussions with fellow painting students I know we all benefited from his instruction and guidance during the week."